North Dakota’s oil production from its Bakken Shale formation continues to grow, reaching 660 thousand barrels per day (bbl/d) in June 2012. With a back-to-back 5 percent rise in oil output every month, North Dakota does not expect the pace of production to slow down. The Bakken Shale formation has a substantial amount of associated gas, which is a raw natural gas released as a result of petroleum production. Natural gas is often found in oil wells, where it is either dissolved in crude oil or exists separately in a form of a cap above oil. The United States now ranks as one of the world’s top five flaring countries, according to the World Bank’s recent report. That is largely due to the rise in oil drilling in North Dakota. 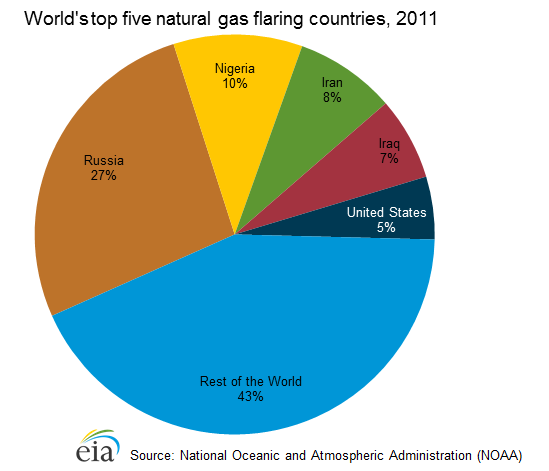 In 2011, the United States represented 5 percent of all gas flaring. Since Nigeria's oil fields lack the infrastructure to produce and market associated natural gas, much of it is flared. According to the National Oceanic and Atmospheric Administration (NOAA), Nigeria flared 536 Bcf of natural gas in 2010 – or about a third of gross natural gas produced in 2010, according to NNPC. In 2011, the NNPC claimed that flaring cost Nigeria US $2.5 billion per year in lost revenue. DAKAR/PORT HARCOURT, 8 March 2012 (IRIN) - Despite longstanding laws against gas flaring - the burning of natural gas during oil extraction - in Nigeria, and shifting deadlines to end the practice, the activity continues, with serious health consequences for people living nearby.